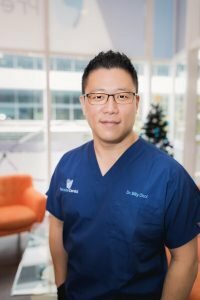 Dr Billy Choi was born in Seoul and his family moved to Australia in 1991, and since, has always resided locally attending Brisbane Boys’ College and graduating from University of Queensland in 2003 with a Bachelor of Dental Sciences Degree. Upon graduation Billy has provided his services throughout Brisbane area before deciding that it was time to create a practice with a team of like-minded professionals here at Precision Dental. Billy recognises the importance of continuing education and enjoys learning the latest advances in dentistry and refining clinical skills to ensure the benefit of his patients by regularly completing national and international post-graduate lectures and seminars. He is registered with Dental Board of Australia and is a member of the Australian Dental Association, Australian Society of Implant Dentistry and the Australian Association of Laser Dentistry. With more than 15 years of experience, Billy practises high standards of dentistry at all time, takes pride in the quality of treatment he provides and feels confident in all aspects of general and cosmetic dentistry. In his time away from dentistry, Billy currently enjoys cycle and spending time with family and friends. He also has fine interests in rugby, football, poker, snowboarding and wakeboarding.